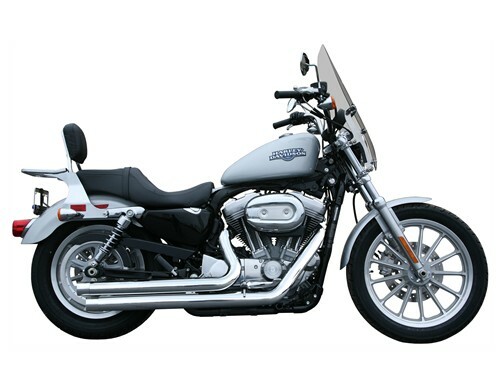 Rush Sportster Full System Exhausts - 2-1 Performance Systems, Mid-length, Short Style, replacement tips - at MD Racing - a one stop performance shop for your motorcycle needs on the street and on the race track. Rush introduces a complete line of full-pipe systems for the Sportster models. These are available in chrome and black ceramic. Every head pipe is coated wih exclusive 1700o ceramic to ensure excellent heat dissipation. Full Systems come standard with 3522-R1R tip. Different tips can be purchased separately. See our performance tip page.